Maastricht’s Roman and Spanish ruins, collection of interesting museums and wonderfully varied French and Belgian architecture make it a Netherlands must-see. The Bonnefantenmuseum is probably the best known and has some impressive modern art as well as earlier European works, but you’ll also probably want to visit the Museum Aan Het Vrijhof and see the wonderful fort and basilica. As well as being beautiful and historic it’s also a university town, so it can be pretty lively. The best places to stay in Maastricht tend to be in the glorious historic centre. Take a guided tour of the tunnels and caves beneath Maastricht dating back over 800 years. Intriguingly, there's also underground galleries and the guides provide a lot of interesting information about local history. Situated in a vast old church, the Boekhandel Dominicanen is a bookstore like few others. Worth a visit even if you're not in the market for a book, simply for the unique architectural setting. 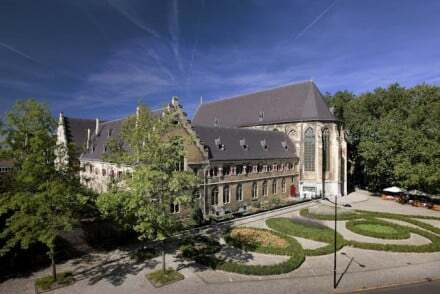 Visit the stunning and tranquil Basilica of Our Lady (Onze Lieve Vrouwebasiliek) - a historic religious site where visitors can light a candle and enjoy a moment of peace in the city centre. Enjoy a coffee or some local food in Vrijthof, a lovely, central square - perfect for soaking up the local atmosphere and people watching. There are concerts held in the square which are always a special occasion. The fort offers an interesting glimpse into the military history of the area and is often combined with a tour of the tunnels. The views of the town from the hilltop fort are also rather impressive. The best places to stay in Maastricht will fill up quickly during the peak summer months so book quickly to avoid disappointment. The Kruisherenhotel Maastricht is a 60 room hotel converted, from a 15th Century Gothic monastery, into something which looks like a home decor magazine spread. There’s the perfect meeting of old and new and you’re right in the heart of town. If you'd prefer a self-catering option this holiday, don't hesitate to visit our online partner Booking.com for a selection of centrally located properties, ideal for exploring the town. Fly to Maastricht Aachen Airport located 14km (8.5 miles) from Maastricht with a range of flights across Europe and further afield. There's a public bus that connects the airport to the town and rail stations. Alternatively, catch a train to Maastricht with rail connections to major destinations including Amsterdam and Belgium. Best time to visit - the summer from June to September provides the warmest weather and there's often concerts in the central square as well. This Design hotel and former Gothic monastery, dating back to the 15th century looks like something from an Elle Decor shoot. Rooms juxtapose old & new: exposed stonework with pop colours and artwork, large arched windows with statement furniture. Surely the most stylish way to discover Maastricht!